Some people are loose and relaxed, so their knitting tends to be loose and relaxed. Others are tense and tight, so their knitting is also tense and tight. Unlike machines, we humans have unique quirks and tendencies, and this extends to our knitting. That’s why two people who are knitting the same pattern with the same yarn and the same-sized needles can end up with two different-sized pieces. It all boils down to tension, or in other words, how tightly you knit. So, you can imagine the problems that arise for a pattern designer. How can she account for every knitters’ tension so that both the tightest and loosest knitter can knit the same pattern in the same size and end up with identically sized garments? 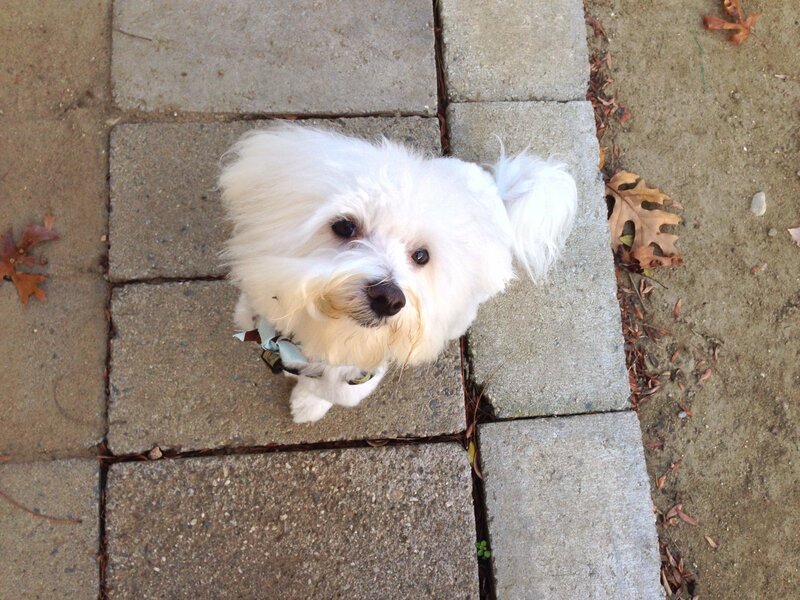 You guessed it – with gauge! Think of gauge as a way to measure tension. What is Knitting Gauge, Exactly? This means that if you knit 10 stitches for 14 rows in stockinette stitch, these stitches should measure 4 inches in width and height. This piece of knitting is called a gauge swatch. If your gauge swatch matches the gauge of your pattern, then you’ve achieved the correct gauge (or, tension) that your pattern requires. Now you can start knitting. Wahoo! Now, you can’t change your knitting tension. It’s unique to you, and flows naturally from your fingers. So unless you’re pulling your yarn in a death grip or knitting so loosely that you’ve got holes in your fabric, embrace your knitting tension. It’s yours and yours alone! Both needle size and yarn weight are controllable, and you can play around with them to get the gauge for your pattern. But How Do I Actually Knit this Gauge Swatch? First: choose a yarn and a needle size that you’ll potentially use for your pattern. Most patterns will have a recommended needle size and yarn weight. Use these as a starting point. Then, it’s time to cast on. 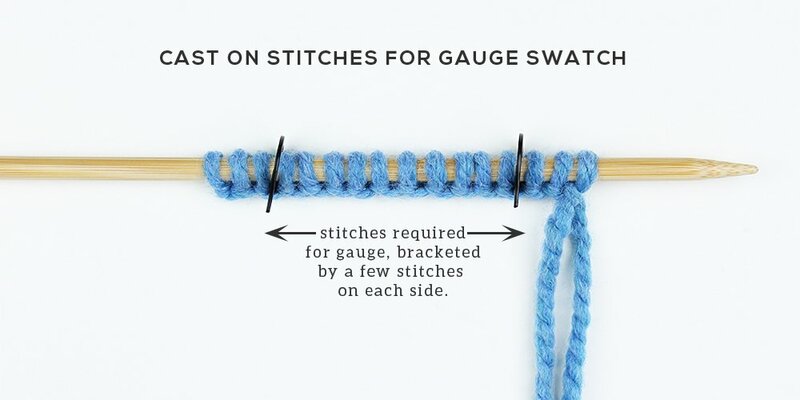 The rule of thumb is to add a few extra stitches onto your gauge swatch. Our hypothetical gauge asks for 10sts and 15 rows in stockinette. Adding a cushion of extra stitches gives a more accurate reading. It’s also easier to measure. Now, let’s knit in stockinette stitch! Rather than knit exactly 15 rows, let’s knit 20 or so rows. Once you’re done, get your measuring tape out. Let’s Measure This Gauge Swatch! So here’s the moment of truth. Does your gauge swatch match the pattern’s? Oh, the suspense! A possible delay: If you want to be super accurate about your gauge, then you’ll need to follow this extra step. It’s not “mandatory,” but if you’re knitting a garment that needs precise sizing or if you’re a perfectionist, then you’ll want to stick around for this. For Super Precise Gauge Seekers: Before you measure you swatch you’ll want to wash it. Yep. Wash it. Treat this swatch as if it were a mini-me of your final yet-to-be-knitted project. If you plan on handwashing your finished garment, then handwash the swatch. If you plan on machine-washing it, do the same for your swatch. Then, let it dry and manhandle it a bit: pet it, scrunch it up, leave it in the sun. The idea is that you want an accurate measurement of how your knitting will react in the “real world” after it’s been washed and worn. Once you’ve washed and manhandled your swatch, you’re ready to measure. Okay, back to regular programming. You’ve got your gauge swatch. Now, let’s measure it! Let your swatch lay flat and, without pressing or stretching it too much, measure out 4 inches. Then count the stitches within that 4 inch range. Do the same for the rows. Here, I’ve got a handy gauge ruler that makes measuring easier, but you can do the same with a regular tape measure. In this example, I’ve got 9 stitches and 15 rows that make up a 4 inch square. My gauge is a bit too loose. I need to tighten it up. My Gauge Swatch is Too Small/Large. What Now? Let’s say you measure out your gauge swatch, but it’s only 3.5-inches in width and height. It’s too tight! What do you do? You’ve got two options. You can either switch to a larger needle size or use a heavier weight yarn. By switching to a larger needle, you automatically loosen the tension of your knitting. As a result, you gauge grows in width and height. That 3.5-inch gauge swatch may fill out to 4-inches once you increase the needle size. It’s a good idea to start increasing needle size in increments of 0.5mm. For example, if a 4mm needle gives you a gauge that’s too tight try a 4.5mm needle. If that’s stil too tight, try 4.75mm or 5mm. This also works in reverse. If your swatch is too loose, try decreasing your needle size in increments of 0.5mm. Instead of changing your needle size, you can use a heavier or lighter yarn weight to get gauge. If the concept of yarn weight is confusing, check out the Yarn Weight glossary entry. In our example, the gauge swatch is too loose. Let’s say we used a chunky weight yarn to knit it. To tighten the tension, we can move down one rung in the yarn weight ladder and try a heavy-worsted weight yarn. Knitter Beware: As with option 1, if you choose a dramatically different yarn weight than the one specified in the pattern, you may end up with a too-tight or too-loose fabric. Ultimately, gauge is about experimentation. Start with the pattern’s recommended needle size and yarn weight. If these don’t get you the right gauge, try different combinations. My Gauge Swatch Matches the Pattern’s. Can I Start Knitting? You’ve got the right combo! Needles, yarn, and your own knitting tension are working in beautiful harmony. You’re on the same gauge wavelength (gaugelength?) as the pattern. The search for gauge is over! Do a happy dance and start knitting your pattern! Sidenote: I’ve heard “gauge” pronounced an assortment of ways, from “gouge” (as in gouge out an eye) to “goodge” (a mix between goo and sludge). General consensus seems to settle around a pronunciation that rhymes with cage. Think: “gage.” Personally though? I kinda like goodge. Goodge. It is very interesting explanation and I think I go it!!! thank you. New to knitting and so glad I found this before reading or watching ANYTHING else. Thank you! I have yet to pick up a needle but I have a huge collection passed down to me. I really hope to knit a hat for my soon -to-be here baby! Hey Meghann! So glad you found this useful! I’m planning on resizing the Big Hat for kids, so stay tuned for that! Happy knitting, and any questions, just shoot me an email or comment! Sorry, I’m still struggling a bit with this. When you knitted your test swatch, you ended up with 9 stitches and 15 rows in your 4 inch square. You said “My gauge is a bit too tight”. This makes me think that I don’t understand what “tight” and “loose” mean in this context. If I understand correctly, having 9st instead 10st in a 4″ swatch means that your stitches are LARGER than expected, which would translate (in my inexperienced head) to gauge being too “loose”… not too tight. If the stitches were too tight, each stitch would be smaller, meaning that more stitches would fit in the 4” square. 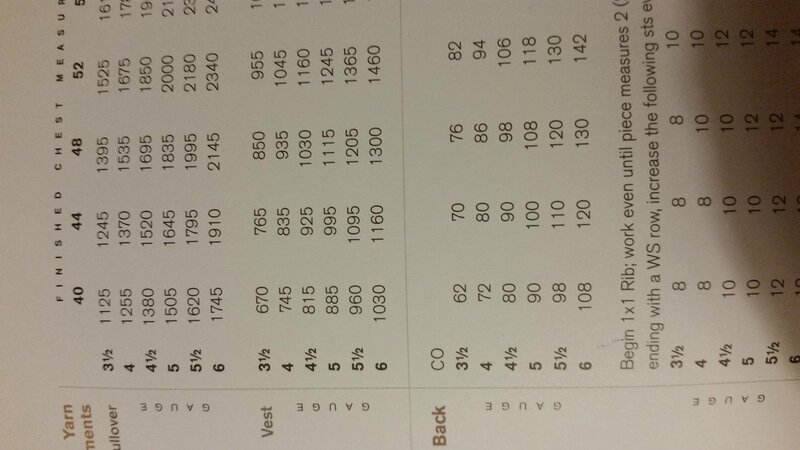 If the gauge is “too loose” then you would have only 8 or 9st per 4″, because each stitch would be bigger. Am I crazy? Please help me understand. Thanks so much for posting this article, it is very thorough and it’s just this one bit that I’m not getting. Hi Stacey, Sorry for the delay in responding. Ah! You’ve pointed out such a glaring mistake on my part. You’re absolutely right. My gauge is too LOOSE – not too tight. I’ve gone in and corrected this post with a credit to you at the end of the post. Thanks for pointing that out, and sorry that my mistake caused you so much confusion! Thanks so much for this post, really helpful! Just wondering what to do if I got the right gauge in height but not width? Supposed to have 13 stitches, 20 rows to 4 inches. I got 18 stitches, 20 rows to 4 inches. Can you help?? Hey Dana, I would try using a larger knitting needle. Increase by .5mm and see if you can’t hit the gauge for the stitch. What are you knitting, by the way? Gauge really matters for things like sweaters and cardigans, but not *as* much for accessories. Thanks for sharing such wonderful information. I love to know if you could share where can I get hold of this stitch counting gauge for your knitting sample? If your pattern calls for two different sized needles, one for ribbing and one for the main pattern, do you increase the size of both needles? As for your question: yes, if your pattern asks you to use two different needle sizes, then you’ll need to get two different needles in the sizes that the pattern specifies OR you can opt for an interchangeable needle set, which is a better deal if you knit a lot. in your big hat patter, u said the gauge is 9 sts which equals 4 inches, you didnt state the number of rows you have to do. so do you have to do 9 by 9 square? There’s no row count for the gauge of the Big Hat because the pattern will tell you the height measurements in inches rather than asking you to count out rows. So as long as you have the stitch count for the gauge, the rows don’t really matter for the Big Hat pattern. My gauge is usually off. Either the rows or the stitches. The gauge for the sweater I would like to knit is 18 stitches and 22 rows (for the 4″ swatch). With my swatch the 18 stitches are good but my rows are 26. I’ve used the recommend needle (size 10). I’m confused as this is normal for my swatches. Yeah, I totally understand that gauge is a bit of a juggling act. However, I find that after blocking my swatch, I can usually get the stitches or rows to match the gauge. Sometimes you can cheat a bit. For instance, if you get the stitch count but you don’t get the row count, you can do some math and work out the length of each part of the garment you’re knitting. For example, if the pattern tells you to knit 32 rows and then work the decrease, you can work out how long 32 rows actually measures and then knit to that length instead of counting your rows. If 26 rows = 4″ then 32 rows = ? So, back to the pattern. We would knit until our piece measures 4.92″ (aka. 32 rows) and then do our decrease. All this to say that just because you don’t get the pattern gauge *exactly* you can still knit the pattern as long as you do some math and make the pattern work for *your* gauge. It’s generally easier to play around with the row count than it is with the stitch count, but if you’re a math whizz and you’ve got your head around the mechanics of the pattern, then anything is possible! I would like your help in interpreting the use of needles size. I read on the label on yarn that use a no eg. 4-5 which to me could mean needle size 4-5 or 4mm-5mm. Please comment which is which. Thanks. Hi Patricia, Hmm.. I’ve never heard of “eg” as a unit of measurement for knitting needles! Is the yarn label in English? “Eg.” is also a shorthand for “for example,” similar to “ie.” so it could be suggesting either a US 4-5 (3.5 and 3.75mm) or a 4-5mm needle. I’ve enjoyed reading this but I still have a problem. I have a pattern that has 6 different gauges for a sweater. Then it also has different sizes. I’m not sure how to read it. If I take a pic. can you help? Hey Jessica, hmm…your sweater might be a multi-gauge pattern, meaning that it has instructions for multiple gauges, which is pretty cool! Yes, do take a photo and upload it here. Yes! Of course you can swatch with circular needles. The general rule of thumb is that if you’re knitting your project back and forth on flat needles, you should knit your gauge swatch on flat needles. And if you’re knitting your project in the round, the gauge swatch should also be knit in the round. I’ll be publishing a video on how to do the latter this week! If you’re knitting a project back and forth, you can swatch with your circular needle as well as flat needles. With circular needles, cast on as normal, but don’t join the round. When you reach the end of your row, switch hands and continue knitting. Makes sense? Good luck! I am a new knitter, and while my stitch (width) is pretty close, the rows(height) is too long. Ie. finished size should be 7 1/4 x 9, mine is 7 1/4 x 9 1/2. What would cause this and how can I correct it? I hate when that happens! So close, yet so far! I would suggest going down a needle size by 0.5-1mm and try swatching again. If your stitch count ends up a wee bit smaller than it needs to be, but the row count matches, then what you can do is lightly block the gauge swatch to stretch out the row count so that it reaches 4″. You can manipulate your fabric quite a bit when blocking! Because you’re so close, I would only do a light block, meaning, don’t dunk your whole swatch in water. Just lightly throw some water onto the swatch to dampen it and then stretch it out so that it’s 4″ x 4″. Hi I am working on a pattern that says the gauge is, “1 square = 9 x 9″” Does this mean I need to make a 9 x 9 square to see what size needle I need to use? I’m so confused by this. I tried starting square 1 without gauging it (because I didn’t get what it was asking me to do), using the suggested size 8 needles and my square came out HUGE. I got to row 52 and it was already over 20″ in. in length and over 11 in. in width. I sized down 3 needles and it appears to be 9″ in width but I’m still worried it won’t be okay and I didn’t gauge it (because I still don’t fully get the directions). I would appreciate any help! Thanks! Hey Elisabeth! It looks like the pattern doesn’t give you a traditional stitch/row gauge. Instead, it suggests an aran weight yarn and 5mm needles and estimates that a knitted square will be about 9×9″. I think they’re being loose with the gauge because you’re knitting a blanket, so the fit isn’t super important the way it would be for a sweater. The fact that you’re getting a square that’s twice as large as what it should be, is a bit alarming. Are you using their suggested aran weight yarn? Hi! Thanks for replying! Yes, I bought the exact yarn they used just so I could make this blanket. I’m using bamboo needles…maybe that makes a difference? When I started knitting, my stitches used to be really tight but as I’ve gotten more comfortable with it over the years, they’ve become quite loose. I’ve gone down 2 needle sizes and will see what happens. Your explanation of why it’s not a traditional gauge makes a lot of sense though. I’ve never come across one like that before so I was confused as to how to make a swatch for it. Hey Elisabeth! The fact that your needles are bamboo won’t affect your knitting gauge that drastically. If you’d like your squares to be exact squares and not rectangles, you can cast on and knit your square as normal, and once it reaches the same height as your cast on edge (the width of the square) then you can cast off. This will give you a square and not a rectangle. Hope that helps, and good luck! My pattern says 5mm needles for rib band & size 6mm needles for main body of garment. My gauge is tight so I need to increase my needle size for the body of the garment, will I also need to increase the needle size for my rib band accordingly? If you find that the ribbing knit with 5mm is too tight, then you can increase the needle size as well. It’s really up to you! The gauge for the ribbing is not as important as the sweater itself. Just thought I (you) might pass on this hint. Interesting! Thanks for sharing! So, I’m guessing your wife needed to re-work the pattern by multiplying every stitch count by 1.3? For example, multiply the cast on number by 1.3 and so on? My gauge was okay in the swatch, but after knitting 12 rows (sweater, stockinette stitch), I now have 2 too many stitches per inch. Should I rip out and try to increase tension? Any other suggestion? Hey Barbara! Yes, I would suggest going down a needle size to reach that gauge. Are you knitting your project in the round? And if so, did you knit your gauge swatch on flat needles? Sometimes, the tension between knitting in the round and knitting on flat needles is different because knitters *generally* tend to purl looser than they knit. If the majority of your project is knit in the round, I’d suggest also knitting your gauge swatch in the round. Hope that helps! I am a machine knitter. Can I use this swatch gauge on my knits? To be honest, I know very little about machine knitting, so I’m not sure if the gauge for machines would apply for hand knitting. Sorry about that. This is great and makes sense. But what does it mean when your gauge is accurate in one direction, number of stitches, but not in rounds of stitches. In my case, 22 cast-on stitches equal four inches across and 33 rounds (rows) equal three inches. So my swatch is 3″x4″. Guess, what? When I blocked the swatch this morning, it stretched on the perpendicular but not the horizontal side. It is perfect. Thank you so much for your site. This very helpful! Awesome to hear that! Yes, blocking does wonders! A little pushing and pulling of the swatch during blocking can usually even a gauge swatch out. Happy knitting! Thank you for the information. Here’s my question. I had to change needles from a size 6 to a size 3 in order to get the correct gauge (per pattern the gauge was 22 stitches in ss size 6 over 4″). Once I determined the size 3 was going to work for my sweater I looked at the pattern. It calls for a size 6 needle and a size 3 needle. So if my size 3 is now my size 6 what other size needle do I use? ())Thank you for the information. Here’s my question. I had to change needles from a size 6 to a size 3 in order to get the correct gauge (per pattern the gauge was 22 stitches in ss size 6 over 4″). Once I determined the size 3 was going to work for my sweater I looked at the pattern. It calls for a size 6 needle and a size 3 needle. So if my size 3 is now my size 6 what other size needle do I use? This was after switching yarns. The last yarn I was swatching on I didn’t get correct gauge until I was using a size 1 needle. The yarn and pattern called for size 6. I’m not sure why my swatches are coming out so much bigger. My tension seems even and I hold my yarn woven between my fingers. Any thoughts on how I can increase my tension? The pattern I am using calls for 2 needle sizes. Which one do I use for the gauge? My guess is the one that does the main part of the body – not the ribbing? Thanks. Yep! You’re right. Use the needle that knits up the bulk of your project. In this case, the needle that knits up the sweater body, and not the needle that’s used for the ribbing. 13 stitches and 16 rows = 4 inches in stockinette. Can you help? Not sure what I am looking for. Thanks! Thanks Lynn! It took me a good three years (!!!) of knitting before I fully understood how gauge worked. Before that, I just sort of winged it, and when projects came out too small or too big, I just chalked it up to my bad luck instead of, y’know, my complete lack of understanding on gauge! Good luck designing your own cardigan! Sounds very exciting!